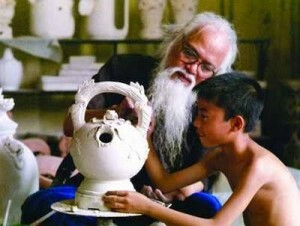 Bat Trang Pottery Village is located in the south east of Hanoi, passing Chuong Duong Bridge turns right and go about 10km along the dike of Red River. Bat Trang belongs to Bat Trang Commune, Gia Lam District, Hanoi, Vietnam. This is a pottery village with a half-millenary historic development. Some decades recently, the vitality of this village is still blown up by the thousands of pottery-kiln on fire day and night.